Critically endangered sea creatures like Pacific turtles face extinction unless conservation zones are shifted to follow their migration paths, experts have warned. Current marine protection areas designed to preserve under-threat species generally cover fixed geographical spots where they feed, mate or rear their young. 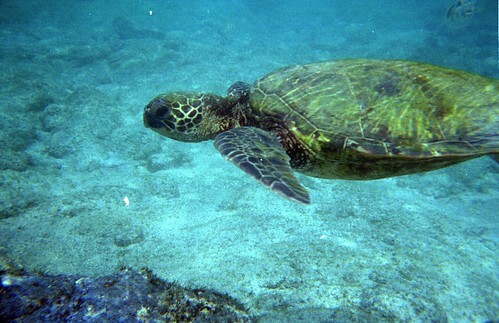 But to prevent endangered turtles, sharks and other creatures from dying out the designated no-fishing zones ought to be made mobile to ensure the species are always protected, experts said. Although the concept has existed for some time, it has only recently become technologically feasible to constantly monitor endangered animals and shift conservation areas accordingly. Satellite tracking devices are now small and affordable enough that they can monitor the precise location, including the depth, of large numbers of sea creatures. Commercial fishermen could be told by authorities not to enter certain areas or to avoid using particular types of equipment at set times in the year to limit the risk they posed to endangered species, researchers said. This would be particularly useful in so-called "convergence zones" where opposing currents pushing together create vast fields of plankton and attract the rest of the food chain, making the waters especially crowded. One of the largest examples, the North Pacific Convergence Zone, moves 1,000 km from north to south seasonally, crossing waters used by Hawaiian fishermen. The zone is also used as an "interstate highway" for loggerhead turtles, a critically endangered species, as they migrate, researchers said at the American Association for the Advancement of Science (AAAS) annual meeting in Vancouver. Larry Crowder, professor of marine biology at Stanford University, said: "The North Pacific Convergence Zone is always there, but it moves. "We usually think of protected areas as being in a place, and we think of that place as being locked down to a map. But places in oceans aren't locked down to a map, they move." Making conservation areas mobile would also account for non-annual ocean trends, like El Nino, and the effects of climate change which are causing species to move from their traditional habitats, he added.